Friends of the Wild Whoopers has created this question and answer section, “Ask Tom Stehn” in an effort to provide scientifically accurate information to the public regarding the Aransas-Wood Buffalo Whooping Crane flock, the only self-sustaining wild population on earth. Tom Stehn will answer questions concerning conservation, management and future needs of the Aransas-Wood Buffalo population of wild Whooping Cranes and they will be posted on this page. If you have a question about the wild flock send us an email at admin@friendsofthewildwhoopers.org. Back in 2008, my wife and I visited the Rockport area of Texas, we had heard about the Whoopers, but had never seen any before. We could not have timed our first visit better. That year up in Wood Buffalo, a pair of breeding Whoopers had raise two colts, and as I understand because of the difficulty in two chicks surviving, they would normally be referred to as Twins. I was able to take pictures of the parents with the twins in Lamar. I sent you a picture of them, and asked if this was the twins that had been talked about. Your response was yes. We were so thrilled to have seen them, not to mention it happening on our very first visit. The following winter, we spotted what appeared to be the same family group, in the very same place. I have sent pictures to Pam along with a slide show I put together, and some videos of them foraging for food. May be you can let me know what you think about them being the same family. Seeing “twin” chicks at Aransas is quite an encounter since it doesn’t happen very often. Congratulations on your encounter seeing twins. Of 500 chicks that made it to Aransas between the years of 1938-1965 and 1997-2010 (a total of 42 winters), 34 of the chicks were with a sibling, namely only 17 sets of twins. With 34/500 = 6.8%, you can see how unusual twins making it to Aransas is. Data from the years 1966-1996 is excluded since one egg from multiple nests was picked up in Wood Buffalo National Park and either hatched in captivity or put under sandhill cranes at Grays Lake NWR, Idaho. To show you how many twins made it to Aransas, I’ll list the # of sets of twins from 1997-2010. I helped with aerial chick surveys in Wood Buffalo National Park for about 10 years, and we often noticed loss of one of the two twin chicks in the first couple weeks of life right after a period of cold weather and rain. To me, only when nesting ground habitat is in excellent shape and crane food is abundant will a significant number of twin pairs survive. For example, in the winter of 2006-07, a remarkable seven sets of twins made it safely to Aransas, with 5 sets of twins arriving in 2010. I don’t have access to recent data beyond the 2010 winter after which I retired from FWS. I remember after the last year of egg pickup which was in 1996, the very next winter (1997), one pair of twins showed up, and they were the young of the Big Tree pair on Lamar that you had seen and photographed in the 2008 winter with twins. I always felt that the winter feeding of corn to that pair maybe helped them be in such excellent condition and helped them raise twins, but with a sample size of one, I can only speculate. I looked for color bands in the two photos you sent. I see one aluminum band above the right knee of one of the Big Tree adults with the twins. Despite not all the legs appearing black in the photos for which I have no explanation, I don’t think any of the other birds are banded. In the photo you sent of the 4 white-plumaged cranes, none of them have bands. Therefore, they are not the Big Tree pair with their two young from the previous year. Also. the Big Tree pair would not let their offspring from the previous year stay in their territory the following year since they are territorial and chase all other cranes away. Thus, I’m guessing the photo of the 4 white-plumaged cranes you sent could be 4 subadult cranes foraging together. On March 19th, we posted an article on our Facebook page relating to a whooping crane that was spotted while it was stopping over near Alda, NE. That article, along with a similar article elicited some very interesting questions and comments such as, “does this whooper think it’s a sandhill, how do we know it is the same whooper, why is it alone, and is it biologically irrelevant?”. We decided to send the article to Dr. Tom Stehn and get his thoughts and input. His thoughts should shed some light on some of the questions and thoughts that were posted by several of our readers. “Chris Helzer, director of science for the Nature Conservancy in Nebraska, has published a reflective article on the role of individual whooping cranes in a population. He bases his thoughts on a lone whooping crane that has been seen “for about two decades or so” on the Platte River in March among huge concentrations of the migrating sandhill cranes. My guess is that the “lone whooper” he writes about is not the same bird every year. Subadult whooping cranes may migrate by themselves, joining huge flocks of sandhills that utilize similar habitat. They may even be “persuaded to migrate early” as the sandhill cranes are leaving the Texas Coast before the time that most whooping cranes migrate. During my time studying the whooping cranes at Aransas, we documented several whooping crane chicks that had apparently gotten separated from their parents during the fall migration that would winter with sandhills elsewhere along the Texas Coast or even in Oklahoma. These chicks would presumably return to Wood Buffalo National Park in the summer, but for several winters might winter away from Aransas since their parents had never shown them where Aransas was. In one such case, a whooping crane banded Blue-White wintered off the refuge, but paired up as a three-year-old, and its mate brought it to Aransas where the pair established a winter territory that I observed for multiple winters. This demonstrates that there is no instinct in whooping cranes to winter at Aransas. The parent cranes show their chick that Aransas is a good safe place to winter with bountiful blue crabs and wolfberries to eat, and the knowledge gets passed on to the next generation. Most subadult whooping cranes are social and spend the winter in loose associations with other non-breeding whooping cranes. But some subadults tend to spend the winter by themselves at Aransas. I remember one color-banded subadult that was by itself every time I sighted it throughout the winter, but then nested that summer. It had apparently found mate in a hurry, either in migration or upon reaching the nesting grounds. That bird might well have been by itself in migration. The USFWS data base on the whooping crane migration would provide data on how many sightings of single whooping cranes there are in migration. I don’t think it is particularly unusual. Dr. Stehn, now that you have been retired from USFWS for a few years, looking back over your career while working with whooping cranes, is there one or two memorable moments that stand out that you would care to share? Were you ever able to visit the nesting grounds at Wood Buffalo National Park and if so what were your impression of the nesting grounds? Wow Jeff, you asked the perfect question, since what is more fun for an old timer than reminiscing? I think the highlight of my career was the two times I helped radio-track whooping cranes between Texas and Saskatchewan in the spring of 1984 and 1985. I was on the road each time for almost exactly a month, watching the birds whenever they were on the ground, and then radioing the tracking aircraft when the birds started a migration flight. I even wrote a scientific article on the visual clues I would see starting about 30 minutes before a flight that “told” me the birds were going to migrate that day. One day I tracked from the aircraft, watching white crane dots soaring in circular patterns as they climbed on thermals up to a mile high and then glide down at 60 mph to 1,000 feet before catching the next thermal. One day, the birds in Kansas had encountered extremely strong west winds and at the end of a day’s flight were actually further away from their nesting grounds in Canada than from when they had started that morning since they were pushed so far to the east. About 45 minutes before sunset, the cranes took off in slow flapping flight (no thermals to soar on), and instead of heading on their usual bearing of 320 degrees (NNW), they flew due west (270 degrees). They were apparently course-correcting after realizing how they had been blown way too far east that day. Think for a second about the amazing navigation ability of a whooping crane that has a brain about the size of a golf ball. They always know where they are! They flew past sunset until there was just a glimmer of light remaining in the sky. The radio signals then became very weak and sporadic, indicating the birds were walking in shallow water. We figured out approximately where they were, but couldn’t see them behind a farm house. The next morning at sunrise, we approached the farmhouse and told the farmer that whooping cranes may have spent the night on his place. He told us there was a pond about 100 meters behind his house, and sure enough, when we walked back there, we found their tracks. We quickly called the tracking aircraft to get them in the air where they had a detection range of nearly 100 miles when the birds were high in flight. All month long, we moved when the birds moved, but I remember a week sitting in the same spot in Saskatchewan with the birds staying put despite favorable migration weather. Some locals who would come visit us daily felt sorry for us on Easter morning and brought us an Easter basket full of goodies to make us feel less homesick. What nice folks we encountered everywhere. When I started counting the whooping cranes on weekly census flights, there were only 71 birds present in the flock at the end of the1982-83 winter. I remember clearly (well sort of clearly since I got a bit airsick on every flight) when my census first tallied over 100 birds in the 1986-87 winter and the 200 barrier in the 2004-2005 winter. The day I counted 200 for the first time, I’d had business meetings in Florida the day before and got stranded in Atlanta trying to catch a commercial flight back to Corpus Christi. I re-booked the flight to Houston, and then rented a car for the 4-hour drive, getting home about 2 AM and having to be at the airport at 7 AM for the census flight. I was exhausted, but somehow stayed awake and kept marking crane locations throughout the day on maps on a clipboard on my lap. When we finished the flight, I was too tired to tally up my figures. That evening, sitting at my kitchen table, I realized the plateau of 200 cranes had been shattered as my figures added up to 213! In my final year working with cranes, the crane flock reached 283 cranes, quite an increase from the 71 cranes I’d counted 29 years earlier. 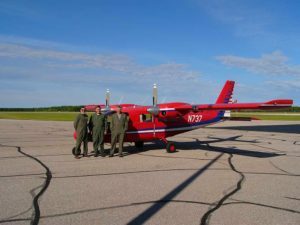 I was extremely fortunate to help take part with aerial chick surveys up in Wood Buffalo National Park for about 10 summers. What a magnificent park that is with wood bison and wolves roaming the prairies, and huge expanses of marsh that spread to the horizon where the whooping cranes find a safe haven away from most predators to raise their young. 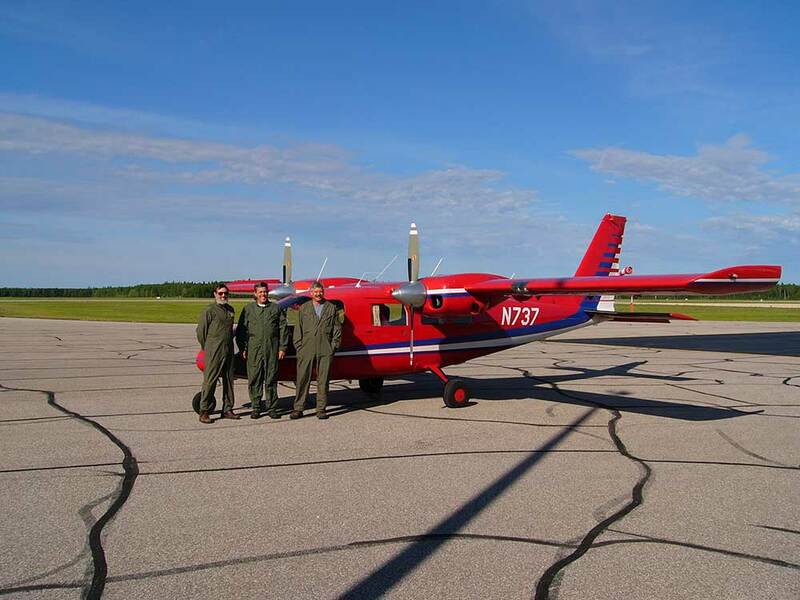 In mid-June, USFWS pilots flew from Albuquerque, New Mexico in a twin-engine high-wing Partanavia survey aircraft that had a plexiglass bubble nose on it like a helicopter. The visibility from that plane was unmatched. What a thrill to look for young chicks just a few days old, quite a task when they were underneath their parents or hidden by tall cattails. And the very talented pilots had their skills stretched to the max as they had to avoid dead tree snags and descend down into the smaller marsh complexes to allow us to see the tiny chicks and read colored leg bands to identify the adults. The two engines on the Partanavia gave us a better margin of safety with the additional power plus a safety valve if one engine failed. Bird strike does considerable damage. 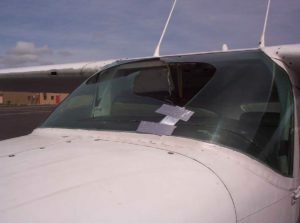 In all my years of flying as an observer (over 4,000 hours in my career), we had three bird strikes, including during my final spring 2 American avocets that came through the windshield leaving two holes the size of basketballs. As I think more, maybe that encounter was my most “memorable” moment in my career. I’ll certainly never forget it. I have been so lucky having great experiences trying to learn about and help an iconic endangered species. Thank you all for all the interest that people around the world have shown towards the magnificent whooping crane. I understand that Whooping Cranes have run out of space on their winter habitat on Aransas National Wildlife Refuge (ANWR) and that about 50% are wintering off the refuge. Is suitable wintering habitat available for purchase in the vicinity of ANWR? What is being done to acquire more wintering habitat if available? Thank you, Elizabeth P.
In 1941 when there were only 15 whooping cranes remaining in the flock, they wintered on the Aransas National Wildlife Refuge in the area of Sundown Bay, which I’ve always considered as hallowed ground for the species.